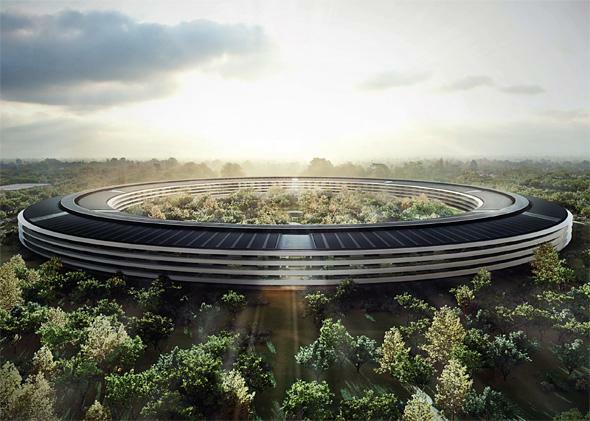 Apple headquarters: New spaceship campus wins Cupertino's approval. Apple’s New Headquarters Are a Massive Monument to Privacy. Apple’s Privacy, That Is. In planning meetings, Apple refused to put trees too close to the campus walls because it worried about intruders climbing them and hopping the fence. Apple is not, as far as I know, a shadowy, secretly villainous corporate monolith seeking to control and ultimately subjugate the human race for its own nefarious ends. If it were, though, the company’s new headquarters would make a Hollywood-perfect setting for its machinations. Late Tuesday night, the Cupertino City Council unanimously approved Apple’s plans for the circular new campus, which will cover a Pentagon-sized footprint and shelter some 13,000 workers from the outside world’s prying eyes. The building was a late-life dream of Steve Jobs’. When he pitched the schematics to Cupertino officials in 2011, Jobs compared the design to that of a spaceship. The public can drive around the road that circles Apple’s current headquarters, two miles to the west at 1 Infinite Loop, putting them within a few feet of Apple’s offices, sacred geek territory. The new headquarters building will be set far off the road, just as HP’s old offices were. And Apple plans to increase the number of trees on the land 50%, making the offices even harder for prying eyes to spot. How important is security on the new site? In one email exchange with city staff, an Apple executive haggled over the location of a single tree. Apple has legitimate reasons to want to keep its work out of public view. Yet there’s something vaguely dystopian about the way the world’s most powerful tech companies wield their wealth to attain impenetrable privacy while insisting that the public’s privacy concerns about their products are overblown. Apple is by no means the worst offender in this regard, and in fact the company deserves credit for some of the privacy features it has built into products such as its Safari browser. Still, the optics of its new campus, which turns ever inward on itself so that its wealthy employees never have to engage with the outside world, are less than heartwarming. Meanwhile, in other Silicon Valley real estate news, Facebook founder and CEO Mark Zuckerberg has reportedly spent tens of millions of dollars to buy up four homes surrounding his own Palo Alto abode, then lease them back to the families that are already living there. It’s not that Zuckerberg wants to live in any of those houses, you see. He just wants to control who does.